Here in the Austin area flagstone is quite popular. We have been using it in a variance of structures, from patios to pathways, flagstone has a rustic elegance about it that can’t be found in any other medium. Here at Archadeck of Austin each of our clients get their own design rendering. These design renderings are never used again, so the structure you get from us, is yours and yours alone. 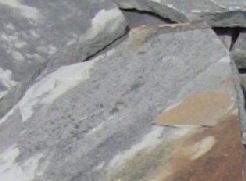 Since flagstone is 100% natural since it is cut from the earth, every piece of flagstone is different as well. No two flagstone projects will be the alike because no two pieces of flagstone are identical. 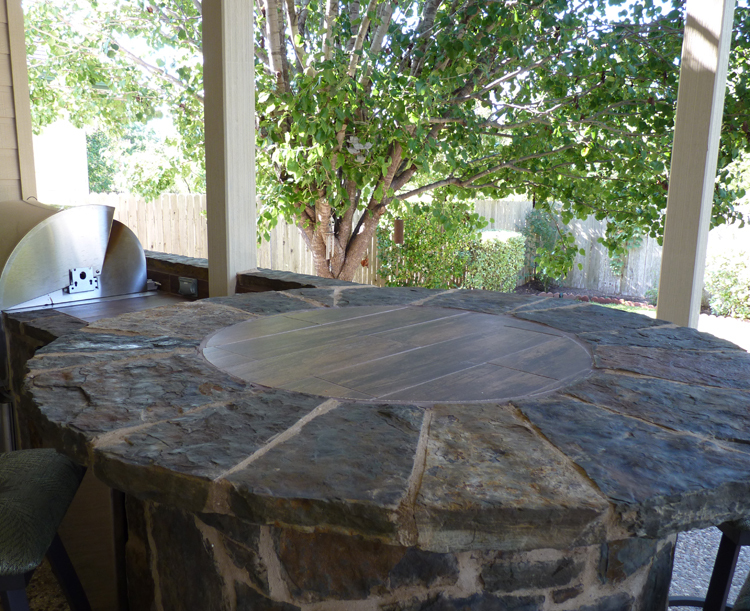 Deciding which flagstone to use can be a difficult decision because of all the different types, colors and patterns of flagstone there are to choose from. We want this daunting task of selecting the type and color to be a little easier for you and hopefully after you have reviewed this blog, you will have a little better idea of the basics of flagstone selections. When talking about natural stone such as flagstone there are words that are used to describe certain attributes of the stone itself such as undulation which are natural wavelike bends, curves and elevation differences you can see and feel throughout the stone. Veining refers to a pattern or natural markings that are visible in the stone. Swirling means any curving, twisting line or shape visible naturally within the stone. Oklahoma buff peach is a very popular color. Customers choose this color frequently with its subtle pleasing tones. The variation in the tones of Oklahoma buff peach can vary from peach tones, taupe tones and even gray tones.The surface tends to be smoother and not have as much undulation as some of the other Oklahoma’s. Other Oklahoma flagstones include the dazzling Chocolate gold, which has quite a bit of undulation and veining. The veining of this flagstone gives it a rich, robust feel. Variances in Oklahoma Chocolate gold can be deep browns, to gray and of course the gold hues as well. Oklahoma taupe is another favorite of ours. It has a fair amount of undulation but a more neutral feel. It conveys variation of taupe, light gray and earthy browns. This color works well with a lot of different mediums. Then you have Oklahoma Silver mist. The name itself gives it away. It has a silvery-misty sort of look to it. Color varies from darker grays to light silver, and slight blue undertones. 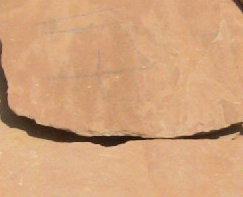 The Arizona flagstones tend to be more of a sandstone type of stone. They have a Smoother surfacing with less undulation. Not as bumpy as your Oklahoma’s. They have a sandier , flatter look to them. Arizona buckskin is a good neutral flagstone. Neutral does not mean boring in the case of this flagstone though. When I look at this color I am reminded of a buckskin horse. This color can only be achieved through mother nature. It is rustic, yet elegant, tough yet soft. The natural pigment of the earth is apparent in the hue. It works well with many mediums. 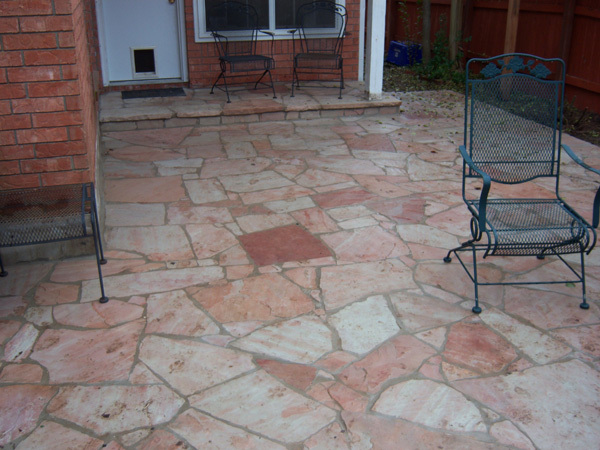 Then there is the beautiful Arizona Rose flagstone. Here in Texas and beyond this is a much coveted color. Arizona Rose is best described as a light brick-red, with natural pink variations and gray undertones. It reminds me of ethnic pottery or the color of the sky right before it disappears into the horizon on a hot Texas night. Even with the entwining of rose and pink variations, this is a great neutral color that will work well with gray all the way to dark brown. 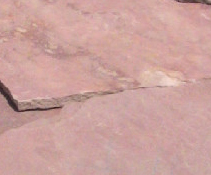 Any color where you have gray or brown undertones will only enhance the beauty of Arizona Rose flagstone. Last but certainly not least we have the Mexican flagstones. 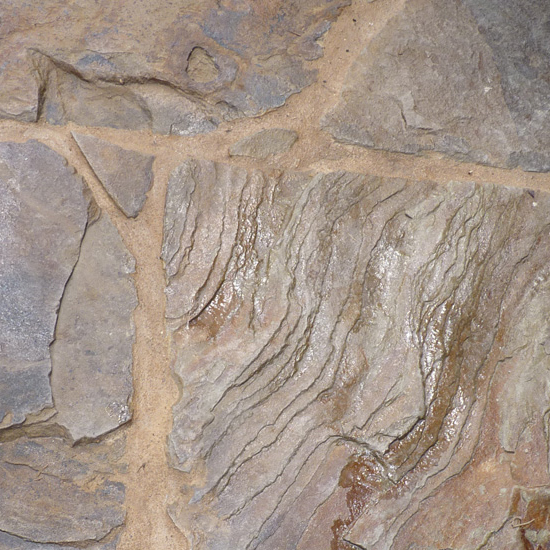 This flagstone has a lot of variation in color and movement throughout the stone such as veining and swirling. It is a work of art in itself. As with any flagstone each piece is different, but the beautiful degree of variation in Mexican flagstone makes it a joy to look at. Mexican Rosewood is probably the finest example of the Mexican flagstones. This color has the hints of terra-cotta you would expect from Mexican pottery, but with variations and swirls of peaches, reds and pinks. Truly original and truly lovely. This entry was posted on June 7, 2011 by austinporchandpatio. It was filed under Austin outdoor bar, Covered patio Austin, Flagstone, Flagstone Patios, Flagstone Patios, Materials, Oklahoma Buff Peach Flagstone, Oklahoma Chocolate Gold and was tagged with Archadeck of Austin, Arizona buckskin flagstone, Austin covered patio, Austin covered patio deck, Austin flagstone patio, Austin Oklahoma Buff Peach flagstone patio, flagstone outdoor fireplace, flagstone patios Austin, Mexican flagstone, Mexican rosewood flagstone, Oklahoma chocolate gold flagstone patio, Oklahomas taupe flagstone, outdoor fireplace, TX.